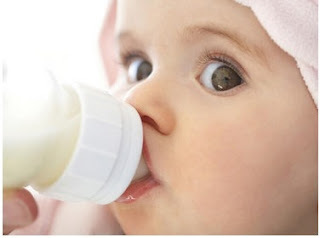 It is very important that you follow all the correct steps to prepare a baby formula bottle. It should be done with a lot of hygiene and being very careful not to contaminate the bottle, so we will avoid making the baby sick and cause discomfort in his stomach that is still very fragile. To prepare a bottle, bottle, bottle or pepe, as you know it first thing to do is wash your hands very well with soap and water. Boiling the amount of water needed should be one ounce of water for each tablespoon of formula. Pour the water into the bottle Add the milk, one teaspoon of formula for each ounce of milk, (use the teaspoon already included in the formula). Mix very well. Cool and drop a few drops of milk on the hand, so you will know is the formula is warm or very hot. And ready for the baby to feed.